I started with a pattern, and a queen sized sheet. Getting all of the pieces out of this particular she was a bit of a challenge. 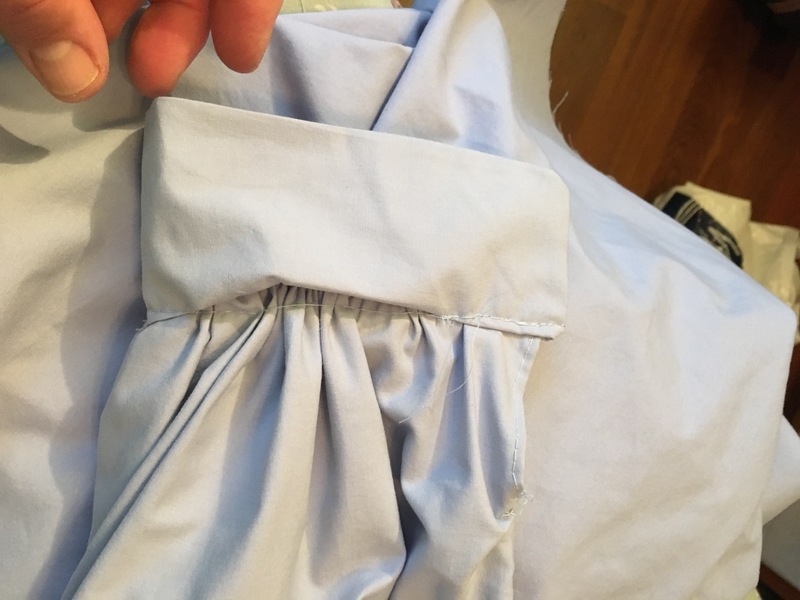 It involved folding and refolding the fabric in several different directions to get the sleeves, the front, and the back. The yoke of the shirt also gave me some trouble. My initial layout, shown here, did not work. As I said there was quite a lot of folding and bending of the sheet in order to get all of the parts in the right size. One of the yoke pieces was a little bit off. After the folding and bending, came the cutting and then the ironing. It’s a used sheet, not particularly bad you understand; it’s just the top sheet where the bottom sheet had become unusable — the elastic all stretched and ripped, and a couple of the corner seams popped. The top sheet is still fine. Ironing a high-quality cotton sheet is a bit of an exercise. 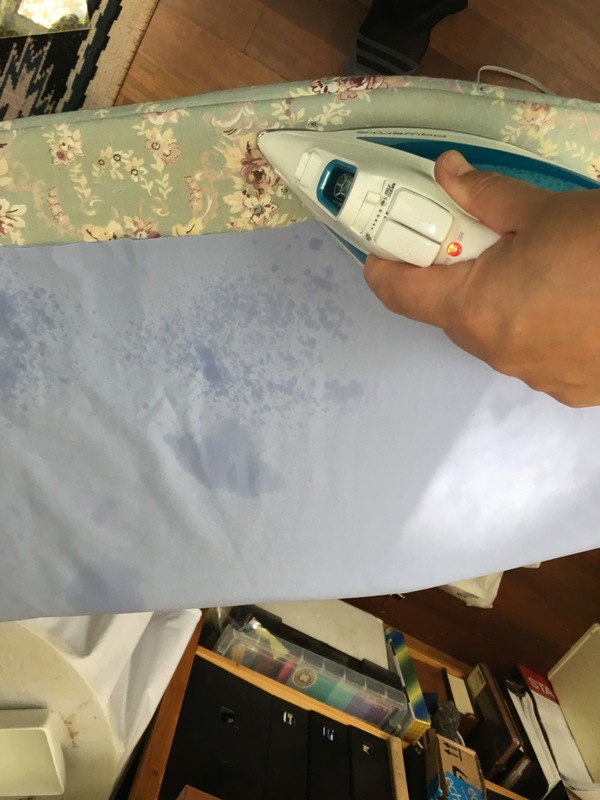 You want it to have some water in it, but not so much water in places that you have to hold the iron on some areas to dry them out, while the rest of the shirt scorches. You want to convert the water on the shirt into steam, to even out the wrinkles. The pattern calls for sewing the arms to the front and the back of the shirt, and then gathering the whole shirt under the two pieces that form a vague oval called a ‘yoke’. It’s a real yoke… I mean, JOKE, because I can either see the dots that are supposed to line up, or I can see that the gathers are evenly distributed… but not both. 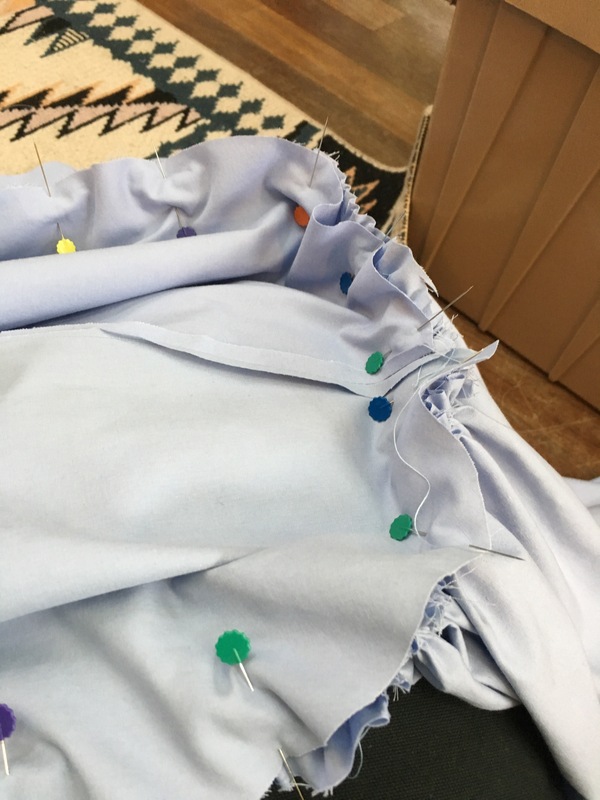 It’s the Heisenberg Uncertainty Principle in action — I can see how fast the sewing has to go (before the gathering threads break or the pseudo-pleats are misaligned or the pins slip), or I can get everything properly positioned, but not at the same time. This shirt is annoying. The pattern does not always match the image. Clearly someone knew how to take some shortcuts. How is it that the seams of the reinforcing yoke around the neck-hole of the shirt do not show on the front of pattern D (upper left)? How is it that the seams of the shoulders are perfectly aligned on the the model’s shoulders, but not on mine? Why does the left sleeve hang differently than the right? 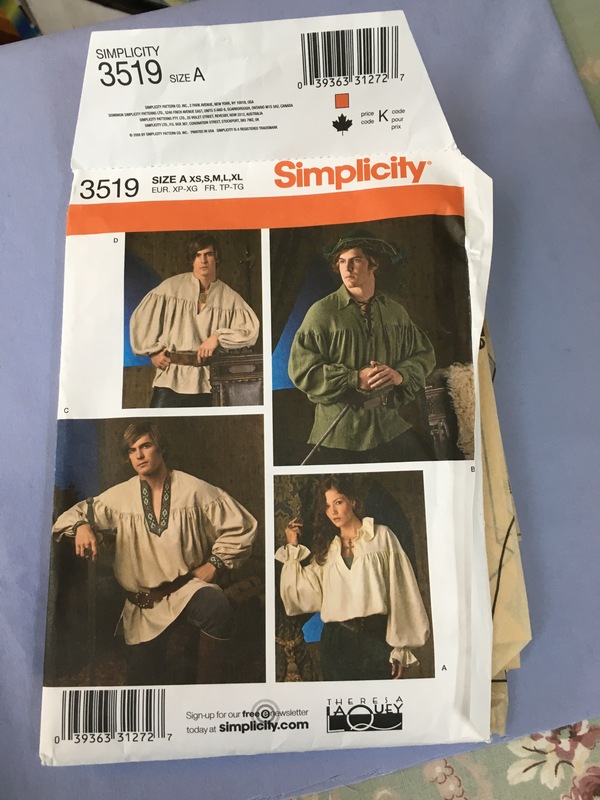 I’m working through this pattern, by the way, Simplicity 3915 size A. There are many things I like about this shirt and pattern, but assembling it is not one of them. This shirt makes me feel all four of these stages at once. I’m finding that I’m enjoying the cleverness of the design, angry that I got myself into this mess, eager to quit, and hopeful that the final shirt will not be quite as terrible as I believe… on someone else. I am glad that I added four inches to to the lower hem of this shirt, front and back, because it would be way too short without those four extra inches. 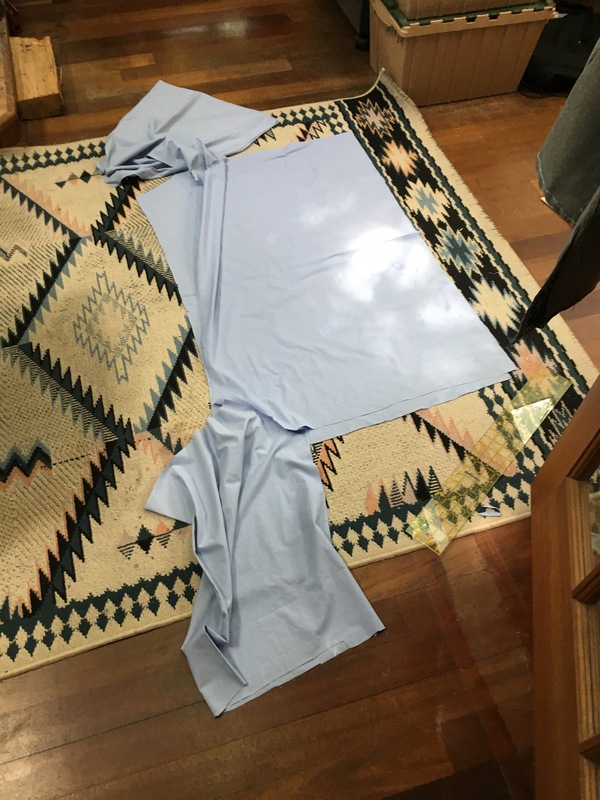 This photo shows the assembly of the sleeves to the front and back of the shirt in a messy, ugly way. I don’t even think they’re attached yet, actually in this photo — and it’s already an ugly shirt. Too boxy. Maybe it will improve. Somehow I doubt it, at least at this point in the process. The Industrial Revolution made it possible to produce hundreds of thousands of yards of thread, and thousands of yards of cloth, at a time. It was an extraordinary achievement. Instead of having one or two new garments a year, it was now possible to have four, or five new garments a year. Or ten, or twenty. Gordon’s meditation on visiting the home of Permaculture in Australia reminds me that clothing in a permaculture world is likely going to look rather different than it does today, because the clothing options that we have right now are not really permacultural. Clothing may wind up looking a lot more ninth or tenth century AD than 21st century AD, at least in part because some of it will be assembled out of local materials by local people — and this particular design is entirely too annoying and fussy to be an efficient way of constructing clothes. Square and triangles, not elaborate curves and fussy bits of folding and gathering and pleating, are a lot easier to structure. Hmmm. The next photo shows a different stage in the construction. At this point, I’m assembling the gathers (a form of pseudo-pleating) and pinning them to the yoke. 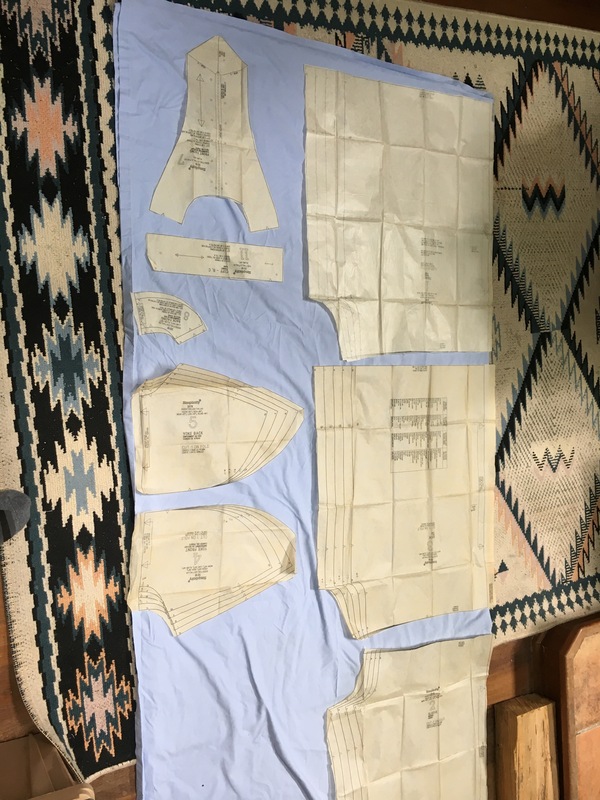 This will be the most difficult sewing operation of the assembly of the shirt — trying to lay out the gathers evenly around four pieces of fabric so that they can be pinned to a pair of pieces of fabric which hare themselves sewn together into a dome shape. SURPRISE! I got this wrong. I won’t know that I got this wrong until the shirt is another six or eight steps down the line — one of which is a completely irreversible cut into the largest and most-irreplaceable piece of fabric. This is, like, the perfect example of a bad design. You can’t really make a beautiful garment if you can’t check the sizing a few times during the initial steps — and if the design requires you to wait until certain things are irreversible to try it on, maybe the design should be reconsidered. Also, the sleeves are huge. One of the mistakes is making the cuffs, and then trying to assemble them. I managed to get one of them done before I ran out of thread. Aiee. I didn’t find more thread right away, but I AM trying to use thread all of the same color so it doesn’t stand out too much against the shirt. There’s problems with the sewing machine. The tension, probably the upper tension, isn’t quite right. It’s a little too loose. My efforts at adjustment are not working quite right, and they’re making things worse. This shirt may survive a few hundred wearings, or it may come apart the first three or four times it’s worn. Poor design, and poor tailoring on my part. a single queen-sized bed sheet contains the makings of a very nice shirt in one of several patterns (most of which are easier than this. a recycled bed sheet makes a good work shirt or ‘formal’ shirt, probably in a less fussy pattern than this. This holds true for a (pretty large) man’s shirt, so you might get 1-3 women or children’s shirt’s out of the same cloth area. Flannel sheets would produce warmer clothes; silk or satin for inner layers/fancier wear. Solid colors would work better than patterns (harder to match patterns when there’s so much folding and working from different sides of the sheet to begin with.